Abdul Rahim Bisharat, a Bedouin chief who lives in al-Hadidiya, an encampment above the Jordan Valley (MEE), is interviewed by Peter Oborne. All rights reserved. OCCUPIED WEST BANK - Exactly 100 years have passed since British foreign secretary Arthur Balfour wrote his famous letter to Walter Rothschild, promising that Britain would help to create a “national home for the Jewish people” in Palestine. Our thanks to the author and Middle East Eye for permission to run this piece originally published here, 29/10/ 2017. Israeli settlers, however, occupy an area of houses above the ancient market, where they are guarded by the Israeli army. These soldiers - I’d guess at least one per settler - stand idly by as the settlers harass, persecute and assault the local population. It needs little imagination to gauge how Israelis would react if a Palestinian who had shot dead 29 Jews in cold blood was given such a prominent resting place in a West Bank town or village. It needs little imagination to gauge how Israelis would react if a Palestinian who had shot dead 29 Jews in cold blood was given such a prominent resting place in a West Bank town or village. 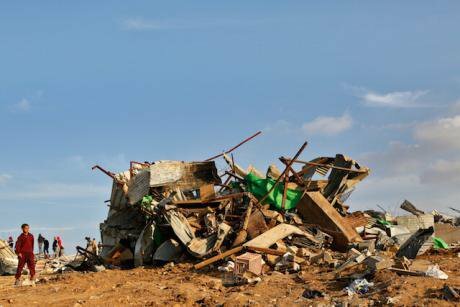 Bedouin children stand next to a demolished house in the village of Umm al-Hiran, southern Israel, Jan. 18, 2017. Xinhua/Press Association. All rights reserved. But May’s exclusion of Palestinians from her celebration next week reflects with uncanny accuracy the exclusion of Palestinians from the Balfour Declaration 100 years ago. Theresa May’s exclusion of Palestinians from her celebration next week reflects with uncanny accuracy the exclusion of Palestinians from the Balfour Declaration 100 years ago. The British treated the Palestinians as non-people then, and still treat them as non-people today. I believe this scornful neglect may be even more damaging for Israelis than it is for the Palestinians themselves because it is such a betrayal of the idealistic and humane vision that brought Israel into being.